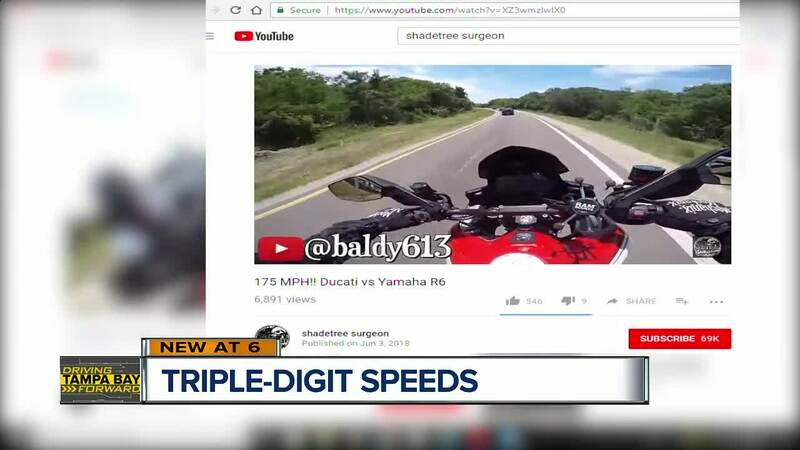 TAMPA BAY, Fla. — A video posted to YouTube claims to capture triple-digit speeds on our Tampa Bay area roads. The video published on June 3 appears to show a number of bikers going through Ybor City, riding at high speeds on the Courtney Campbell, and areas through Hillsborough and Pinellas counties. 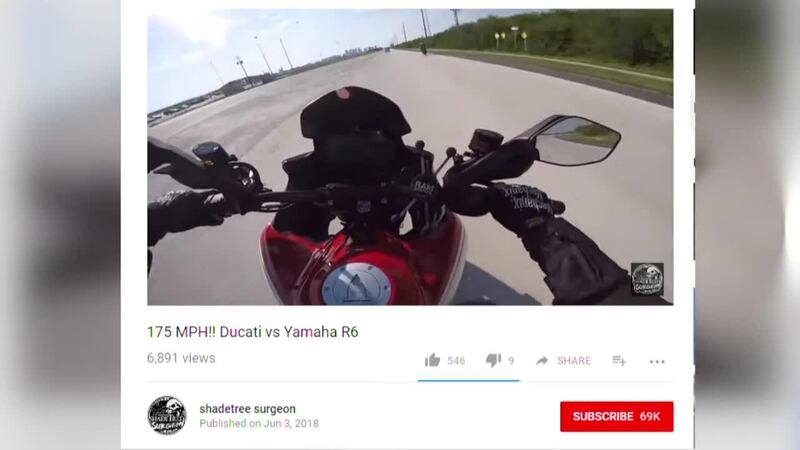 The 15-minute video was posted under the subscriber name "shadetree surgeon" and had nearly 7,000 views. ABC Action News reached out to a man who goes by shadetree surgeon on social media, and called a listed phone number, but the person on the phone would not comment or answer any questions about if they were part of the video. We took the YouTube video to the Tampa Police Department and the Hillsborough County Sheriff's Office but the video link was deleted. Our station was able to provide them a recording of the video that shows two bikers asking how fast they were going. "How fast were you going?" asked one biker in the video. "You had to be going like 160, I was going 145 mph." A man on another motorcycle stated — while laughing — that his speedometer said 175. "That's a good cop answer," replied the other biker. Both departments say they are reviewing the video, but it's hard to arrest people doing reckless behavior because they did not witness it. The biker appears to start recording while leaving a home in Brandon, before heading towards a hang out spot in Ybor City and then taking off on different stretches of roads. "They have skateboard parks, why not motorcycle parks so they can get out and race," asked Ron Galletti, owner of Born to Ride , a local magazine subscription that covers motorcycle trends, stories and shares safety tips. Galletti said the reckless riding can give motorcycle enthusiasts a bad name. "Sometimes people like this end up with a white sheet covered over them too," he said. The veteran motorcycle rider said he's lucky he survived his younger years of riding. Galetti thinks there needs to be more awareness and education in the Tampa Bay area, even a safety campaign that starts when kids are younger. ABC Action News found some departments across the country are part of the D.R.A.G.G campaign, 'Drag Racing Against Gangs and Graffiti.' They use a decked out police car to educate kids and teens. Departments in California and Nevada are part of the awareness campaign. The Seattle Times also did a recent report on how officers are shutting down roads on weekend nights where they know street racing is a problem. A spokesperson for the Tampa Police Department said they don't have a task force for street racing, but they have one officer dedicated to following the illegal activity. At one point, TPD placed barricades on a portion of the Courtney Campbell Causeway when racing was a problem on that stretch of road. The St. Petersburg Police Department tells us they have an actual task force, however, they have not made any arrests. The reason? They say they put officers in place along a portion of the Gandy where racers may take off from, and it deters drivers from their jurisdiction. Florida Highway Patrol also weighed in on the issue, and say they have to enforce illegal racing just like drunk drivers, wrong way drivers, and other reckless behavior through enforcement and being proactive.